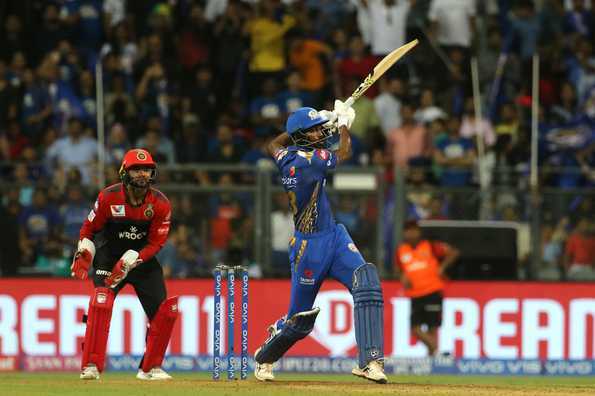 Mumbai Indians are back to winning ways after beating Royal Challengers Bangalore by 5 wickets at the Wankhede Stadium on Monday (April 15). Lasith Malinga’s 4-fer and Hardik Pandya’s late-order cameo pipped Moeen Ali’s all-round show (50 off 32; 2 for 18) and AB de Villiers’s crafty 51-ball 75. How did Mumbai Indians plan for Kohli? It is common knowledge by now that RCB’s batting line-up relies on Kohli and AB de Villiers. So, get them early and it would lead to chaos. Rohit had specific fields set for his opposite number – a wide slip, gully and deep point in place. Jason Behrendorff started with a gift on the pads but soon corrected his line and length and also used the movement on offer well. The left-arm pacer swung it both ways and kept it tight. With the field set to curb Kohli’s run-scoring, he had to work out other areas to get his runs but the Australian seamer was one step ahead. In his second over, Behrendorff dragged his length back and got the ball to deck in. Kohli was caught on the forward shuffle and could only manage an inside edge to de Kock behind the stumps. He was out for 8 off 9 balls. Did the surface ease out? No. Kohli said at the toss there would be some help for the bowlers in the first six and he was spot on with that analysis. Bumrah and Malinga followed up with few tight overs and the assistance on offer for the pacers allowed Rohit to bring on Hardik Pandya straight after the powerplay, the all-rounder striking in his first over. But come the second innings, the old ball spun. Moeen Ali found appreciable spin to castle Rohit Sharma and Quinton de Kock in the same over – a moment in the game that gave RCB a fair shot at making a match out of the game. And they did, until Hardik Pandya found his groove, hitting Pawan Negi for 22 runs in the 19th over of the game and sealing it right there. What start did MI get? RCB have picked only three wickets this entire season in the first six overs – lowest for any team. So having lost the momentum in the final over with the bat, they needed early wickets to defend the below par total but the pace trio (Umesh Yadav, Navdeep Saini and Mohammed Siraj) were all over the place. Mumbai’s openers took full advantage to race away to 67 at the end of the powerplay – second best for the season. Negi, introduced in the 7th over, spun his first ball square to beat Rohit neck and crop. That was what clued Kohli into bringing Moeen from the other end. When MI were struggling against the turning ball, Ishan Kishan showed the way when he took on Negi. Playing only his third ball, after being beaten by a ripper on the previous one, the left-hander used his feet and sent it into the crowd, only to back it up with another. Suryakumar Yadav took a cue from that playbook and lofted Moeen Ali into the stands. The counterattack was on and Mumbai were running away with the game at that point of time. Another trick up Kohli’s sleeve was his forever trump card – Yuzvendra Chahal. Bangalore’s highest wicket taker returned to the attack and sent Kishan packing, after being hit for a six. He then controlled the game with Moeen and the duo only conceded 23 runs from overs 12 to 16. Can RCB’s death bowling bail them out? NO. Bangalore had 42 runs to defend in the final four overs and they were up against the Pandya brothers and Pollard. Hardik took charge of the chase after watching his brother struggle to time the ball. 10 runs in the 17th over with two boundaries brought the equation to 31 off three overs. But Mumbai needed both to go after the bowling and Krunal failed. However, an on-song Hardik made up for Krunal’s strike rate as well. RCB took a gamble, following instructions from Nehra, to bowl Negi in the 19th with 22 required and though he beat Hardik with the first ball, the allrounder closed the game off with a couple of sixes and a couple of fours, lighting the 19th over of the game that also happened to be the last. Hardik remained unbeaten on a 16-ball 37. In contrast, how was RCB’s finish with the bat? After battling through the tough initial few overs, AB de Villiers started to get into his elements and found an able ally in Moeen Ali. From overs 13-16, AB and Moeen managed to speed up proceedings and scored 50 runs. Both batsmen got to their respective fifties in the 17th over and were ready to launch. But they got only 18 runs in the 18th and 19th over, and Bangalore needed a big 20th over to push that 180-mark. De Villiers even started the over with a six. However, Akshdeep Nath didn’t go for a second run, meaning de Villiers was run out by Pollard. Had Nath sacrificed his wicket, Bangalore might have got 10-15 more, but they had to settle with 171. Going into the death overs, it was always going to be a mouthwatering contest – a set de Villiers versus Bumrah and Malinga. The Sri Lankan veteran started the final three overs by sending back Moeen Ali and that left the burden on de Villiers’ shoulder to take Bangalore to a competitive total. The South African had the wood against Malinga but it was his battle with Bumrah in the 18th over that caught everyone’s attention. The Indian pacer was carted for back to back boundaries off deliveries that were near yorkers. He then responded by nailing a yorker right through de Villiers’ legs, then hitting him on the helmet with a short ball and finishing off with another in the blockhole. Bumrah might have gone wicketless, but his figures of 0 for 21 in four overs at the Wankhede was worth their weight in gold. What next for the teams? The win against Kings XI Punjab seems like a blip for Bangalore as they went back to losing ways. They now travel to Kolkata to take on the Knight Riders. Mumbai recorded their fifth win and jumped to third spot on the table. They will next face a high-flying Delhi Capitals team at Kotla. Brief scores: RCB 171/7 in 20 overs (AB de Villiers 75, Moeen Ali 50; Lasith Malinga 4/31) lost to MI 172/5 in 19 overs (Quinton de Kock 40, Hardik Pandya 37; Moeen Ali 2/18, Yuzvendra Chahal 2/27) by 5 wickets.